With a wide variety of features, projects and protocol-compatibilities, there's a Wowza low-latency solution for every use case. Whether you’re broadcasting with Wowza Streaming Engine or Wowza Streaming Cloud, Wowza has the technology to get your streams from camera to screen with unmatched speed, reliability, quality and resiliency. The Wowza Streaming Cloud service now offers a premium Ultra Low Latency feature. 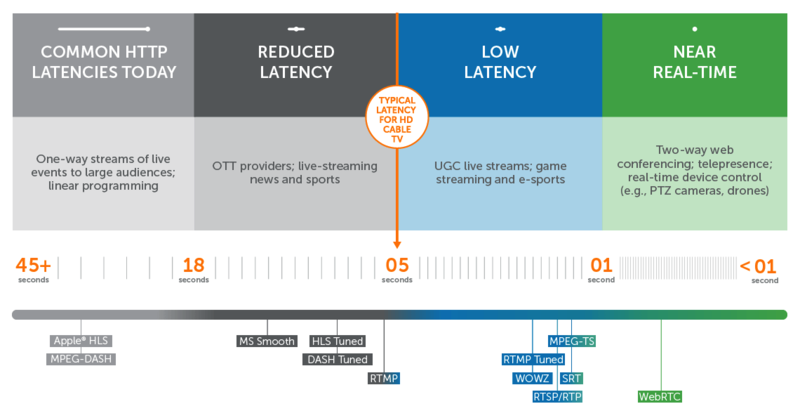 Wowza Streaming Cloud with Ultra Low Latency combines a powerful developer toolkit; enterprise-level stability and uptime; and tools for building interactive capabilities, with sub-three-second latency for audiences of any size. This revolutionary service and API delivers high-quality, ultra low latency video at a global scale for creating tomorrow’s streaming experiences. WebRTC provides browsers and mobile apps with real-time communications (RTC) capabilities via simple APIs. Utilizing WebRTC and Wowza Streaming Engine, web browsers running on desktop, Android, and iOS operating systems can encode and play WebRTC content without the need for plug-ins. Wowza Streaming Engine and Wowza Streaming Cloud support the ingest of streams via SRT (Secure Reliable Transport)—an open-source technology designed to help you deliver high-quality, secure and low-latency video. SRT accounts for packet loss, jitter and fluctuating bandwidth, maintaining the integrity and quality of your stream. Wowza supports nearly all common encoding formats and streaming protocols—many of which can be used to achieve low-latency streams. The format and protocol that are right for your use case depend on your scalability, interactivity and endpoint-compatibility needs. Traditional streaming protocols such as RTSP and RTMP can be used for low-latency streaming, but they don't scale well, and are not natively supported on all endpoints (e.g., iOS devices). They work best for streaming to small to midsize audiences from a single media server. Protocols such as HLS, HDS, HSS and MPEG-DASH work well for streaming to large audiences on a wide range of devices at once, and are easily scalable. They can be tuned for low-latency delivery, but not ultra-low latency or real-time streaming, so they aren't well-suited for two-way and chat. Emerging technologies, such as the WOWZ protocol, SRT and WebRTC, are designed for near-real-time audio, video and data delivery—even over less-reliable connections. These technologies are easily scalable, and are ideal for use cases that require high degrees of interactivity and playback quality.